An overview of Brikit Targeted Search. Searching is a critical way that users will find the content on your site. The out-of-the-box search of Atlassian Confluence is quite effective, and made more so, when users label their content accurately and effectively. In the age of Google, many users prefer search to menus and navigation tools. The out-of-the-box search of Atlassian Confluence is quite effective, and made more so, when users label their content accurately and effectively. When you install Brikit Targeted Search and set up Targeted Search Filter Groups, the power of search is magnified exponentially. Your users' search experience becomes fast, functional and fulfilling. Before you start typing you'll see a list of your recently visited pages. This will search all of your site: pages, blogs, and file attachments and show results scrolling down from the search bar. Use the mouse or arrow keys to select one. If you don't find what you're looking for, you can press 'Enter' in the search field to proceed to the full search results view. 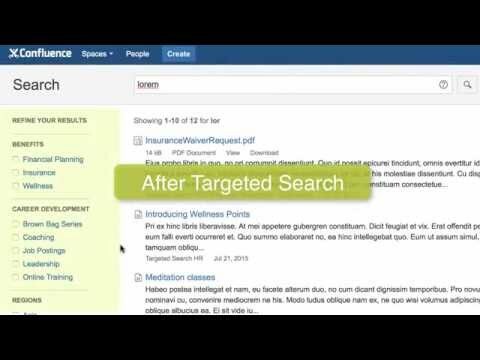 In Confluence without Targeted Search, your Search Results page will offer the opportunity to narrow down your search results by applying specific filters. These include the author, the last date modified or the type of content. There are also options to change the space that is searched. In Confluence with Targeted Search, your Search Results page will display the ability to narrow down your search by any of the filter groups you have configured/identified, as well as the basic Confluence filters of author, the last date modified or the type of content.